China has criticised sanctions imposed by the US on a Chinese firm for selling refined petroleum products to Iran. China's foreign ministry said imposing unilateral sanctions on Zhuhai Zhenrong based on US law was "unreasonable". The US said on Thursday Zhuhai Zhenrong was one of three international firms to be punished for dealing with Iran. It comes as Chinese Premier Wen Jiabao visits Arab oil-producing nations amid fears of major sanctions-related disruption to Iranian oil exports. 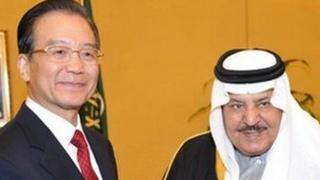 Mr Wen visited Saudi Arabia - China's biggest source of imported oil - on Saturday. He told Saudi Prince Nayef both countries are "in important stages of development and there are broad prospects for enhancing cooperation," China's state-run news agency Xinhua reports. "Both sides must strive together to expand trade and co-operation, upstream and downstream, in crude oil and natural gas," Mr Wen added. During his visit, state-run Saudi oil giant Aramco and China's Sinopec finalised an initial agreement to build an oil refinery in the Red Sea city of Yanbu to deal with 400,000 barrels per day. Later on Saturday, Beijing denounced Washington's decision to punish Zhuhai Zhenrong. "Imposing sanctions on a Chinese company based on a domestic (US) law is totally unreasonable and does not conform to the spirit or content of the UN Security Council resolutions about the Iran nuclear issue," Foreign Ministry spokesman Liu Weimin said. "China expressed its strong dissatisfaction and adamant opposition," he added. Washington has accused Zhuhai Zhenrong of being the largest supplier of refined petroleum products to Iran. The US state department said the sanctions - preventing the firms from receiving US export licences, US Export Import Bank financing or any loans over $10m from US financial institutions - were part of efforts to persuade Iran to rein in its nuclear ambitions. The European Union has also agreed to follow the US by freezing Iranian central bank assets and impose an embargo on oil imports. The sanctions on Iranian oil exports are of particular concern to China, which is under pressure to secure enough energy supplies to keep its economy going. Iran is currently China's third largest supplier of oil, after Angola and Saudi Arabia. Tehran has warned its Gulf neighbours against making up the shortfall in oil exports as the US and EU sanctions start to bite. "We would not consider these actions to be friendly," Tehran's Opec representative, Mohammad Ali Khatibi, was quoted as saying on Sunday. "If the oil producing nations on the Persian Gulf decide to substitute Iran's oil, then they will be held responsible for what happens," he added, in the Sharq newspaper's report.